Brazil Nut Protein Powder delivers the incredible nutrients of Brazil Nuts without all the fat calories - it's a nutritional gem from the heart of the Amazon. This powder is made from Brazil Nuts harvested by indigenous people in a program that protects precious rainforest from clear-cutting. Added to smoothies, cookies, and raw desserts, it thickens recipes while providing plenty of protein - with a full spectrum of amino acids - and hundreds of times more selenium than any other nut. 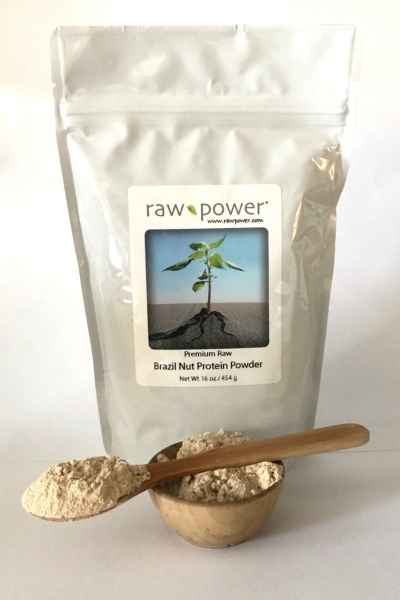 Our Brazil Nut Protein Powder is 100% raw and low-temp processed from harvest to packaging and is 100% pure, with no fillers, additives, artificial ingredients, etc. The only ingredient is raw, organic brazil nuts (cold-pressed to remove oil/fat content). Note: Brazil Nut Protein Powder is one of the main ingredients in Thor's Raw Power! Protein Superfood blends (items #0002, 0003, 0004, 0005).